The subclavian vein courses over the first rib and posterior to the clavicle; the artery lies superior and posterior to the vein (see the image below). 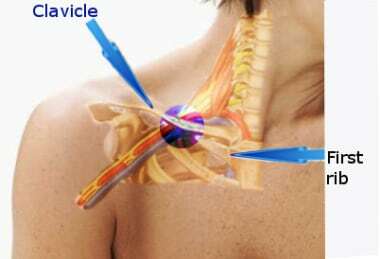 This figure shows the area where the subclavian vein is obstructed in the neck area. The vein is usually compressed by the first rib, clavicle, and serratus anterior muscle. A related condition is thrombosis of the subclavian vein that is induced by the presence of indwelling catheters. The incidence of this condition has increased remarkably over the past two decades because of the extensive use of central venous catheters (CVCs) in patients with cancer and other chronic medical conditions. The demand for a more standardized treatment of subclavian vein thrombosis is growing. However, until randomized data from well-designed trials are available, absolute statements about treatments cannot be made. Linked medical records using administrative healthcare data sets may provide information (eg, readmission rate or level of outpatient services) on the results of treatment of large numbers of patients with subclavian vein thrombosis or significant risk factors (eg, central venous cannulation). Until such information is obtained, the best way of treating subclavian vein thrombosis is to prevent it by limiting the use of CVCs for extended periods. For patient education resources, see Phlebitis. Differentiating catheter-associated subclavian vein thrombosis and Paget–von Schrötter syndrome is important because they appear to have different natural histories. This syndrome sometimes is referred to as spontaneous axillary-subclavian vein thrombosis (ASVT) to express the usually dramatic unexpected presentation of the disorder in otherwise healthy, generally young individuals. Over the past few decades, there has been growing recognition that the disorder can occur equally in both sexes and can affect all age groups. In the 1960s, the term effort-induced thrombosis was applied to this disease to acknowledge that it often follows unusually strenuous use of the arm or shoulder on the affected side. These factors, taken together, satisfy the classic Virchow triad for thrombosis. Furthermore, coexistent hematologic abnormalities that can contribute to thrombosis include protein C deficiency, antithrombin III deficiency, factor V Leiden mutation, and prothrombin 20210A mutation. Introducing catheters and transvenous pacemakers in to the subclavian vein alters the venous flow and increases turbulence. This results in platelet aggregation, release of procoagulants, and, ultimately, fibrin deposition. This causes a further reduction in the lumen of the vessel due to thrombus formation, which eventually culminates in total vessel occlusion. Intravenous (IV) medications and even parenteral nutrition have been known to cause thrombophlebitis. In patients with cancer, an additional contributing factor is that the tumor may generate procoagulant factors, predisposing to thrombosis at sites remote from the tumor. Other causes include transvenous pacemakers, factor V Leiden mutation, protein C deficiency, protein S deficiency, antithrombin III deficiency, and prothrombin 20210A mutation. Long-term parenteral nutrition  and use of hemodialysis catheters  account for some cases of subclavian vein thrombosis. Trauma is only rarely associated with this syndrome. In a few cases, the diagnosis remains unknown. However, routine follow-up with these patients has revealed the development of lung cancer within 1 year of follow-up. The most common lung malignancy associated with subclavian thrombosis has been the Pancoast tumor. Before 1967, thrombosis of the axillary or subclavian vein accounted for 1-2% of all cases of deep vein thrombosis (DVT). Since then, the incidence has risen as a consequence of more frequent use of central venous access for multiple clinical conditions. Among patients with effort-induced thrombosis with subclavian vein stenosis, the thrombosis occurs in the dominant arm in 80% of cases. Case fatality rates for untreated ASVT-related pulmonary embolism (PE) may be as high as 10%, a figure comparable to that seen with PE originating from the lower extremity. The long-term consequences of venous occlusion cause substantial morbidity related to persistent pain and swelling for protracted periods. These symptoms occasionally are severe and can be exacerbated by physical activity, particularly with extended use of the affected arm. Consequently, this syndrome can lead to occupational disability and can adversely impact the patient's quality of life. Conservative treatment consisting of bed rest, limb elevation, and anticoagulation is associated with a worse outcome. Some reports suggest that as many as 74% of patients treated with these conservative measures have residual disability as compared with those who are treated with thrombolysis. Paget J. Clinical Lectures and Essays. London, UK: Longmans Green and Co; 1875. Von Schroetter L. Nothragel Handbuch der pathologie and therapie. Vienna, Austria: Holder; 1884. Hughes ESR. Venous obstruction in the upper extremity (Paget-Schroetter Syndrome). Collective Reviews. 1949. 88:89-127. Ge X, Cavallazzi R, Li C, et al. Central venous access sites for the prevention of venous thrombosis, stenosis and infection. Cochrane Database Syst Rev. 2012. 3:CD004084. [Medline]. Berea-Baltierra R, Rivas-Ruiz R, Vela-Martinez E, Sevilla-Gonzalez Mde L, Talavera-Pina JO, Valencia-Jimenez E, et al. Risk factors for subclavian vein thrombosis in cancer patients with total parenteral nutrition. J Clin Med Res. 2014 Oct. 6 (5):345-53. [Medline]. Karkee DV. Subclavian vein dialysis access catheter-complications are low. Nepal Med Coll J. 2010 Dec. 12(4):248-52. [Medline]. Margey R, Schainfeld RM. Upper Extremity Deep Vein Thrombosis: The Oft-forgotten Cousin of Venous Thromboembolic Disease. Curr Treat Options Cardiovasc Med. 2011 Apr. 13(2):146-58. [Medline]. Bosma J, Vahl AC, Coveliers HM, Rauwerda JA, Wisselink W. Primary subclavian vein thrombosis and its long-term effect on quality of life. Vascular. 2011 Dec. 19 (6):327-32. [Medline]. Keir G, Marshall MB. Management Strategy for Patients With Chronic Subclavian Vein Thrombosis. Ann Thorac Surg. 2017 Feb. 103 (2):672-675. [Medline]. Levy MM, Albuquerque F, Pfeifer JD. Low incidence of pulmonary embolism associated with upper-extremity deep venous thrombosis. Ann Vasc Surg. 2012 Oct. 26 (7):964-72. [Medline]. Roos DB. Axillary-subclavian vein occlusion. Rutherford RB, ed. Vascular Surgery. Philadelphia: WB Saunders; 1984. 1385-93. Kärkkäinen JM, Nuutinen H, Riekkinen T, Sihvo E, Turtiainen J, Saari P, et al. Pharmacomechanical Thrombectomy in Paget-Schroetter Syndrome. Cardiovasc Intervent Radiol. 2016 Sep. 39 (9):1272-9. [Medline]. A venogram in a patient with subclavian vein obstruction. Long-standing obstruction causes development of collaterals. Recanalization after thrombolytic therapy and stent placement. Patient underwent first rib resection and scalenectomy later.